Born and raised in a family that was inspired by music, my first encounters with melody were from my father and mother. Dad was a jazz and Latin music lover, mom loved pop and Motown. I had relatives that played music and I soon learned to play guitar and sing for family events. Rock music came into my life through my older cousins and uncles. 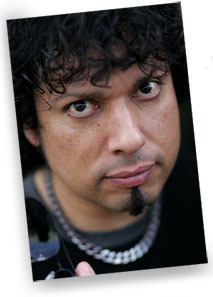 I began to listen to and be inspired by Carlos Santana at 12 years old. Getting into my teen years, Black Sabbath became a fascination and I spent hours learning their music and attempted to mimic the voice of Ozzy Osborne at backyard parties. I found Christ at the age of 15 at the church my mother attended. But the clash between faith in Christ and the rocker lifestyle took its toll on my path and I quit attending church. As time passed, my passion for playing guitar had me in several local projects but it wasn’t until I joined up with my old buddies from high school Robert and Michael Sweet that I had something substantial come my way. We became successful as the band Stryper and ya’ll know what happened in that story…. 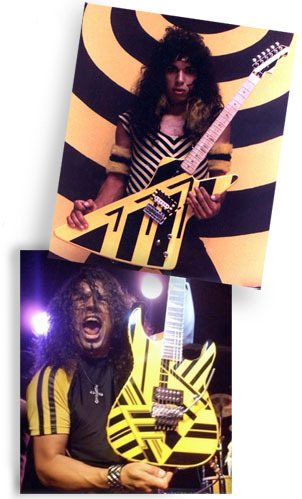 After the break up of Stryper in 1992, I returned to the workforce taking on a warehouse job in Rancho Cucamonga, Ca. One day, to my surprise, Les Carlsen randomly walked in and I found out that he had moved to the area. We started hangin’ out together every now and then. A few years went by and I was asked to go to England for a special event called Meltdown with Michael Bloodgood and his wife Marilyn. A unique friendship spawned between all of us. 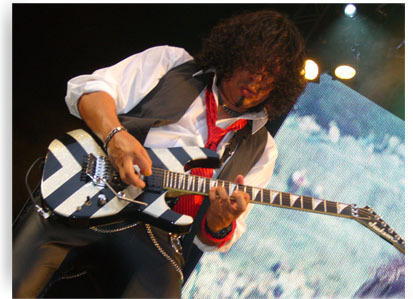 Eventually Stryper re-united in 2003 and in 2006 Bloodgood was facing the same path. Michael B. called me to discuss the idea of being a part of the band. I was honored that they would even consider me. I had pockets of time around the Stryper schedule so I was able to accept the request. By that point I had not been a faithful Bloodgood follower but as I began to learn all the material, I quickly became a huge Bloodgood fan! My Bloodgood brothers have become a big part of my life now and I am so looking forward to what the future may hold for us. Stryper stands for Salvation Through Redemption Yielding Peace, Encouragement and Righteousness. The Isaiah 53.5 under their logo is the Bible verse that states “by his stripes we are healed”. The band earned their stripes on the Los Angeles metal club circuit and in 1984, after recruiting bass player Tim Gaines, signed with Enigma Records and released their debut mini-album, The Yellow and Black Attack (Y&BA). Nearly 30 years later Stryper is still going strong with their latest release “Second Coming”. For more information check out www.stryper.com. Oz had always wanted to put together a comprehensive library of video guitar lessons to help both new and seasoned guitarists learn and hone their craft. After about 15 months of working on and off between touring and recording, Oz reached the goal and now offers a video library of over 50 guitar lessons to the world. 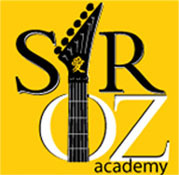 For more information visit www.sirozacademy.com. Vinyl Tattoo is a Classic Rock band giving tribute to rock music of the eras between 1960 and early 1980. This was a time when music was uniquely influential in our culture. Groups like The Jimi Hendrix Experience, Led Zeppelin, Deep Purple, Bad Company, The Who. Black Sabbath and AC/DC became the life giving energy for so many. The members of Vinyl Tattoo grew up with this music and it shaped each of the members careers in different ways, This one of a kind blend of veteran musicians lacks nothing in their true renditions of masterpieces that most bands would not attempt to perform. VT will cook up a unique experience that will leave you believing that Rock n Roll will never die. For more information visit www.vinyltattoolv.com.